Mallorca, more commonly known in the UK as ‘Majorca’ is one of the Balearic Islands on the Mediterranean, south of continental Spain. The new 2014 Mini Countryman - a cool car hire from Majorca Airport. (Please note that within the same rental class you can also be offered a Fiat 500L, a Peugeot Partner Tepee or similar). © Photo: Find-cheap-car-hire.co.uk. See map of the Balearic Islands in Spain. The island of Majorca is a prime beach holiday destination in Europe. The natural beauty of the island, plentiful sandy beaches, warm waters and great weather are especially popular amongst sun-seeking tourists from northern Europe. Because of good road infrastructure and widely available, inexpensive car hire in Majorca, exploring the island in a rental car is a popular option for many holidaymakers. Take advantage of cheap car hire in Majorca by booking in advance. When searching well ahead of your Majorca holiday, you will often find good deals in the class of station wagons or small multipurpose vehicles. A Ford C-max or a Reanult Megane estate are frequently priced at the level of a much smaller VW Polo/Ford Fiesta rental class. Together with Ibiza, Menorca and Formentera, Mallorca forms a Spanish autonomous community of Islas Baleares. The Latin derived name of the island means “major”, as it is in fact the largest of the Balearic Islands. The dimension of Majorca, from west to east is approximately 70 miles and around 45 miles north to south. Majorca’s scenic coastline is about 325 miles long. Majorca is of a similar size to the county of Cornwall; there is plenty to explore and a Majorca hire car can be put to a good use on this island. The language spoken in Mallorca is Spanish. The Mallorín dialect, a version of Catalan is widely used by the locals, but expect to be able to communicate in German and English too. Palma de Mallorca is the capital of the island and its biggest urban centre. Half of the 800.000 population of the island lives in Palma. See the map of Mallorca. The main gateway to the island is Palma de Mallorca Airport. It takes around 2 – 2.5 hours to fly to Majorca from most of the UK airports and the local time is two hours ahead of the Greenwich Mean Time in the summer and GMT+1 in the remaining period of the year. Although Majorcais a year-round destination, the tourist traffic here is the most intense in the summer. For those who choose to spend their summer holiday in Majorca, it pays off to book car hire as early as possible. An Opel Corsa, a VW Fiesta or a similar car in economy class can often be found with prices starting from around £160 for e week car hire from Palma Airport (Majorca), if booked well in advance. Surprisingly low prices (available with early bookings) can be also enjoyed when renting larger family cars offering space for up to 7 people. The prices of Majorca car hire flucutate a lot. If you can settle for the smallest vehicle, it is sometimes possible to find cars to rent at Palma Airport for less than £110 for a week, even in the high season. In Majorca drive on the right hand side of the road. Use of seat belts in Majorca is mandatory at all times, rear and front. Children under 12 are not allowed to travel in the front seat. Baby and child car seats, as well as an adequate restraint system are required. Each car driving in Majorca should be equipped with 2 warning triangles: one to be placed in front of the car in case of an accident or breakdown and one to be placed behind. In case of emergency a reflective safety jacket should be worn by the driver. Important: use of cell phones while driving is strictly prohibited in Mallorca, even if pulled over to the side of the road. You must be completely off the road to use your mobile phone. It is forbidden to use earpiece when driving. Only completely hands-free mobile phone units are allowed. main roads outside of build-up areas: 90 - 100 km/h. motorways (autopistas): 110 - 120 km/h. On many busy roads, including motorways in Majorca, speed limits are variable and adjusted to the intensity of traffic. Speed cameras are frequent in Majorca and the speed limits rigidly enforced. It is not uncommon that tourists from the UK whether driving a rental car in Majorca, or a UK registered car receive fine notification at their home address, even up to a year after their holidays on the Spanish island. Those fines should be taken seriously as ignoring them can lead to future problems when crossing the Spanish border again. Speeding fines in Mallorca range from 100 to 600 euros. As in most popular holiday destinations, the opportunities for alcohol consumption are plentiful in Majorca. Be aware though, that drinking and driving in Majorca is a serious offence, subject to steep fines. You may be submitted to random drink driving test at any time of the day and especially in the evening, in the nightlife areas. The legal alcohol limit for driving in Majorca is 0.5%. Street parking in Majorca is allowed in designated areas with meters and in limited time parking areas. Always check the signage posted in the parking area. Should you be leaving your car in the limited parking area, record the time of your arrival on a piece of paper and place it on the dashboard. Be sure to remove the car before the allowed time is up. Street parking is allowed in blue-lined zones and forbidden in yellow-lined ones. A number of public parking lots, called aparcamientos, is available in major cities of Majorca. It is hard to talk about any particular style of driving in Mallorca, as many of the cars cruising on the mallorcan roads are driven by tourists from all over the world. However, in big urban centres the traffic very much resembles the continental Spanish way: tourists from the UK will notice a whole lot of honking for no apparent reason and overtaking by impatient local drivers. It is just an expression of the effusive southern personality and should not be a reason for distress. Also, expect that on the roundabouts the locals will be driving on the outside lane, even if taking the last exit. Once you have found your way in the Mallorca city traffic, driving in the country side will be a pure pleasure: most of the roads are fairly new and in excellent condition, well sign posted, rarely ever jammed. 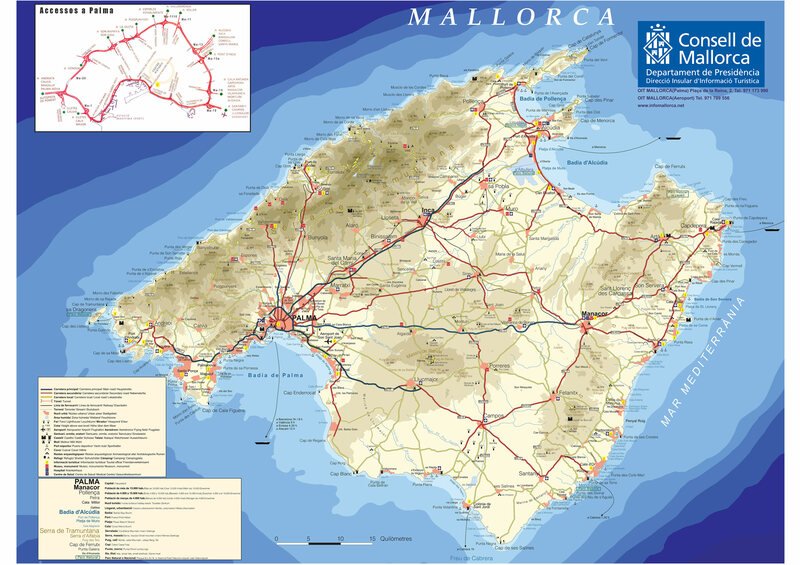 Detailed road map Majorca (click on the map to enlarge). Weather in Majorca – when to visit? Majorca enjoys mild Mediterranean weather with temperatures much more pleasant than in the continental Spain. The most popular time of the year for visiting Majorca is, naturally, the summer. Temperatures between 27 – 30 degrees Celsius registered between June and August are moderated by the refreshing breeze from the sea. For those who would like to avoid crowds and sometimes inflated hotel rates, Majorca holiday in spring and autumn is also a good solution, as the weather remains fairly warm, with solid 23 – 25 degrees. Expect though some rain in October and November. Also, the water temperature in spring may not yet be comfortable enough for bathing in spring. Winter in Majorca is mild, with average temperatures of 14 degrees, still rather warm as for northern European standards. Winter holidays in Majorca are becoming increasingly popular among tourists looking for relaxation and pleasant weather, away from the hustle of high season. Tips and advice on Majorca car hire: speed limits, legal alcohol limit, parking and speeding fines in Mallorca. Cartrawler find cheap car hire Majorca advice.